Looking for a New Acura MDX in your area? CarGurus has 284 nationwide Acura MDX dealers with 39,635 new car listings. Introduced in 2001, the Acura MDX is a luxury SUV that has grown family-friendly with redesigns in 2007 and 2014. Following a 2017 facelift, the 2018 MDX sees only minor updates. Last year’s refresh brought an updated diamond pentagon grille, strong L-shaped daytime running lights framing full-LED headlights, and a chrome accented bumper. The sides are sleek, featuring a crisp window arrangement. Rear LED lights and tasteful chrome appliques round out the design. Two new reds join the color palette for 2018, a deep shade called Basque Red Pearl II and a bright one called San Marino Red. The interior is high-quality. The dual-screen infotainment setup has been revamped for 2018 to include Apple CarPlay and Android Auto compatibility, Siri Eyes Free, integrated Pandora and Aha apps, and more. The MDX excels in space utilization. All three rows are comfortable for both short and long trips. Acura employs a longer wheelbase and elongated rear doors to ease third-row entry and exit. The second-row seats slide forward, backward, and fold flat into the floor to improve cargo space. 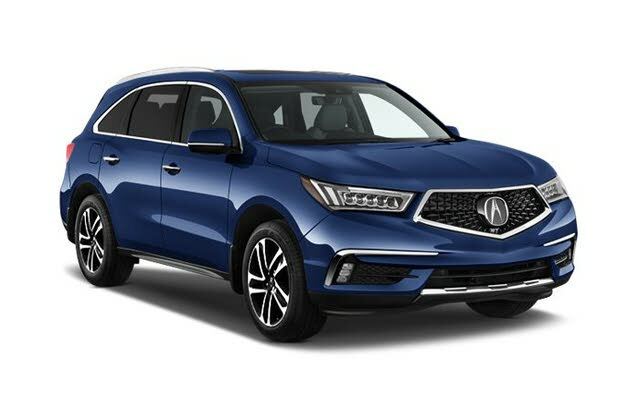 The MDX is motivated by a 3.5-liter 6-cylinder engine good for 290 horsepower and 267 pound-feet of torque, along with a 9-speed automatic transmission. Front-wheel drive (FWD) comes standard, but Acura’s advanced Super-Handling All-Wheel Drive (SH-AWD) is an option. Fuel economy stands at 19 mpg city, 27 highway, and 22 combined with FWD, or 18, 26, and 21 with AWD (with premium fuel). The SH-AWD comes paired with start-stop technology that gives city driving a small boost to 19 mpg. 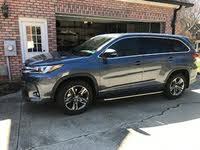 It draws praise for making the MDX feel smaller than its dimensions would suggest, giving the SUV a clear handling advantage over similarly-sized luxury SUVs. The Base MDX comes well-equipped with 18-inch wheels, tri-zone automatic climate control, a 10-way power driver’s seat, an 8-way power front passenger’s seat, a power-adjustable steering column, memory settings, heated front seats, keyless entry and start, sunroof, and first- and second-row USB charging ports. Acura offers several packages to upgrade the base model. The Technology package adds 20-inch wheels, a premium sound system, remote start, navigation, voice recognition, and GPS-linked climate control. The Advance package comes with higher-quality perforated leather, second-row heated captain’s chairs and sunshades, a rear center console, a heated steering wheel, authentic wood veneers, and two third-row USB charging ports. Lastly, the Entertainment package provides upgrades like heated second-row seats, wireless headphones, a 16.2-inch split-screen display. and a 110-volt outlet in the center console. Every 2018 MDX gets frontal and side first-row airbags, side curtain airbags for all rows, and a driver’s knee airbag. A reversing camera, lane keeping assist, adaptive cruise control, and forward collision warning with automatic emergency braking are standard. Optional features like front and rear parking sensors, a surround-view camera system, blind spot monitoring, and rear cross-traffic alert are also available. The Insurance Institute for Highway Safety (IIHS) tested the MDX’s safety as recently as 2017, when it scored top marks in every crash category and a top rating of Superior for frontal crash avoidance, making it a Top Safety Pick +. Acura’s MDX balances drivability, technology, and safety, making it a well-rounded luxury SUV well-suited for families. What's your take on the 2018 Acura MDX? Users ranked 2018 Acura MDX against other cars which they drove/owned. Each ranking was based on 9 categories. Here is the summary of top rankings. Have you driven a 2018 Acura MDX? Enter your zip to see incentives for a new MDX in your area.